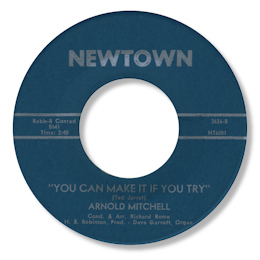 You Can Make It If You Try is one of soul/R & B’s greatest aspirational songs. It was written by that giant of the Nashville scene Ted Jarrett and he cut it first on Gene Allison for Vee Jay in 1957 getting a huge hit. Like Little Milton's "We're Gonna Make It", the message in the lyric toned in very well with African American hopes in the 60s, and it has been recorded by a great many singers as diverse as Yvonne Fair, Freddie Waters and Sunny & The Sunliners. Along with Claudette McKell’s super cut, Arnold Mitchell’s is one of the more obscure ones but to me one of the very best. I love the bluesy guitar, the fat horns and especially Mitchell’s impassioned vocal – throaty and really tough. He sings up a storm on his version of Bland’s “Turn On Your Love Light” on the flip as well. The name of Richie Rome as the arranger would imply a Philadelphia location for this one. UPDATE ~ Naoya Yamauchi has written to say that Arnold Mitchell is much better known as Jock Mitchell - he has also provided several details of Mitchell's life and career which I will include in a new page on him coming soon. I'm really grateful to Naoya for sharing his knowledge and expertise so freely.